That's the crook of my right arm above. Notice the red dot. I went for lab work last week and they drew blood. I know most of the people in the lab, but I didn't recognize the technician who had me. 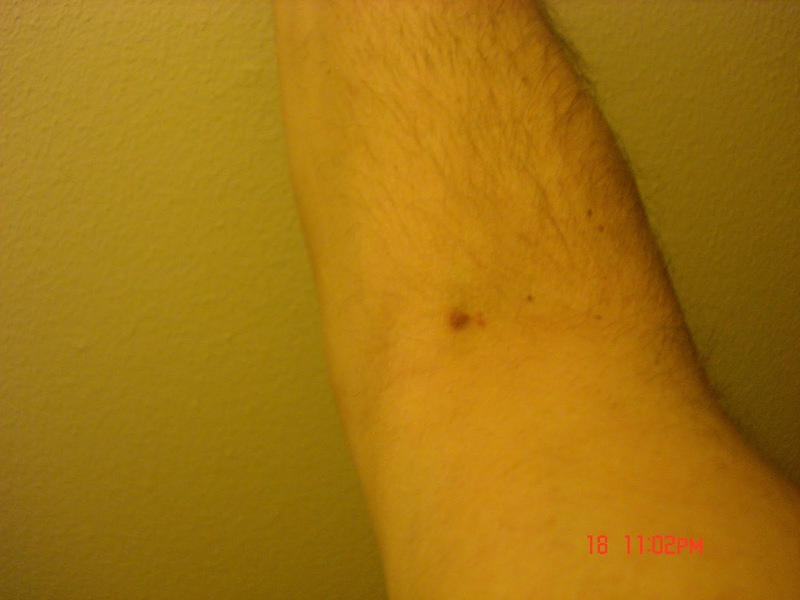 Blood draws can be surprisingly painless, or not. When she jammed the needle into my arm, I almost cried out. Jeez, it hurt like hell, but I hung on. Afterwards, she showed me two small tubes of blood she had extracted. Usually they take four or more, and I was doing tests for two doctors. Anyway, I didn't think much of it until my arm started to hurt. The red spot in the picture has been there for almost a week. I've concluded that a device was implanted to monitor my movements. I don't know if the technician worked for the NSA or was an alien plant, but I've seen these small metal pieces extracted from people who had contact with UFOs. If my arm starts buzzing or lights up or something, I'm going to be pissed off. Then I'll take an Exacto knife and cut out the device myself.